The institution of marriage has its beginnings in creation itself. God created man and woman out of love and commanded them to imitate his love in their relations with each other. As is written in the Book of Genesis, God said: “It is not good that man should be alone. I will make a suitable partner for him…That is why a man leaves his father and mother and clings to his wife, and the two of them become one body.” (Gen. 2:18, 25). In Jesus Christ, the marriage of man and woman was raised to the dignity of a Sacrament. He says, in Mark’s Gospel, “The two shall become one flesh. So they are no longer two but one flesh. Therefore, what God has joined together, no human being must separate.” (Mk 10:8-9). Marriage has become an efficacious sign of Christ’s presence among us. As St. Paul says in the Letter to the Ephesians, “This is a great mystery, but I speak in reference to Christ and the Church.” (Eph 5:32). The celebration of Marriage is also a liturgical act, appropriately held in a Church or Chapel. The marriage of two Catholics should always take place within the Eucharistic Liturgy. 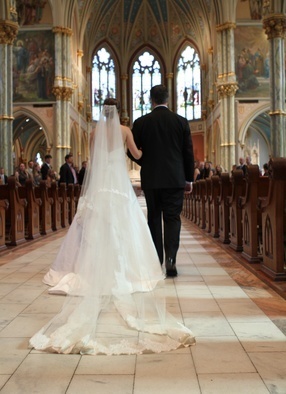 We are happy to assist couples who wish to marry in the Catholic Church. Because the Cathedral of St. John the Baptist is such a popular choice for Catholic weddings, it is necessary that we have clear guidelines which govern the preparation of the couple, the documents to be assembled, the use of the Church, the planning of the wedding liturgy, the music which is to be used, and other details click here. For information about scheduling a wedding, please call the church office at 912-233-4709.